It was one of those dreary days when gray flannel clouds blanketed the sky and errant raindrops pattered against my window, harbingers of the deluge that was to come. The children were at school. The dog was stretched out on the wood floor, her legs twitching as she no doubt dreamt of chasing seagulls on the lonely stretch of beach we often claimed as our own. Though I had laundry to fold and manuscript pages to revise, the quiet house and approaching storm set a scene more conducive for reading than working. With the the rain still pattering and the dog still twitching, I decided to abandon my tasks. I grabbed a stack of books from my nightstand and took refuge upon the cushions of my favorite overstuffed toile chair. At the top of my "To Be Read" stack was the slender biography Elizabeth Vigee Le Brun: The Odyssey of an Artist in an Age of Revolution by Gita May. I looked at the lovely woman with the flushed cheeks and inquisitive gaze depicted on the cover and decided she would be the perfect companion to brighten my otherwise dreary morning. For those of you who are unfamiliar with the name, Elizabeth Vigee Le Brun was an extremely gifted artist and and one of the first women admitted to the esteemed Academie Royale in France. Her superlative talent made her the most sought after portraitist in eighteenth century Europe. I have had a curious, one might say serendipitous, relationship with Madame Vigee Le Brun. We met in the summer of 1978. I was an energetic, inquisitive ten year old; a latchkey kid with far too much unsupervised time at my disposal with which to create mischief. Besides watching television, collecting soda cans to turn in for change to buy Butterfingers and superballs, and playing ding-dong ditch, one of my favorite pastimes was to ride my bike to to the local library where I would lose myself in the world of books...oh, and pester Shirley, the librarian. Shirley was a sweet-face African-American woman who always wore a fascinating little magnifying glass on a gold chain around her neck (which she once let me look through). Shirley was usually patient with me but on this particular day she seemed frazzled and distracted. "I don't have the time for your nonsense today, child," she said, seizing a book from her cart. "Here, go read this. It's about a queen who gets her head chopped off. You'll like it." I took the book but only after peppering Shirley with a few questions. So, I checked the book out, hopped on my bike, and headed over to the donut stand. After purchasing two chocolate long johns and a carton of milk (Are you noticing my predilection for sugary treats? ), I settled myself onto a counter stool to learn more about the business of the queen and her missing head. The queen, of course, was Marie Antoinette (and so began my decades long obsession). In the middle of the book, reproduced in black and white, was a portrait of the queen, standing in a garden, holding a single rose. 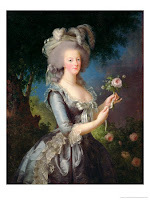 In tiny print, beneath the image, were the words: Marie Antoinette à la Rose by Elizabeth Vigee Lebrun. I would later learn that the portrait was painted to counteract the scandal caused by another Vigee Lebrun portrait, wherein the queen was depicted wearing a modest muslin dress (some felt it was bourgeois attire and therefore inappropriate for a monarch). Fortune favored the inquisitive, bike-riding, sugar-eating child from Toledo, granting her a ticket out of Ohio and to destinations around the world. With a passport full of stamps and a head full of memories, I have indeed been lucky. Years later, I travelled to the Musee du Louvre and the Chateau de Versailles and looked at Vigee Le Brun's portraits of my beloved queen. In the summer of 2000, I travelled to New Orleans for a writer's conference. Depleted from the networking (and narcissism), I opted to skip an afternoon of schmoozing and recharge my creative battery by visiting the New Orleans Museum of Art. I climbed the wide marble stairs to the second floor of the museum and was greeted by Vigee Le Brun's 1788 portrait of Marie Antoinette in a sumptuous blue velvet gown. I'd had no idea the NOMOA possessed a Vigee Le Brun and was thrilled at the serendipitous encounter. My next encounter with a Vigee Le Brun masterpiece occurred in Kansas City at the Nelson-Atkins Museum. I walked into one of the galleries and saw the portrait of a beautiful young woman hanging on the far wall. Something about her innocent face captured my attention and I stood there, staring at her flushed cheeks, bow lips, and brown eyes and wondered what it was about her features that made her seem somehow familiar. I read the plaque on the wall beside the painting and discovered it was of Marie Gabrielle de Gramont, Duchesse de Caderousse and had been painted by Vigee Le Brun. 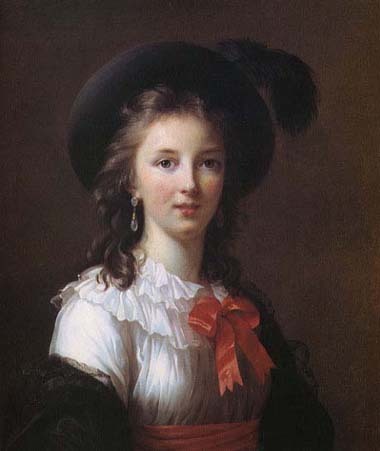 I realized it was Vigee Le Brun's unique talent at incorporating rich colors, honest expressions, and sumptuous details that made the portrait engaging and familiar. Before leaving the Nelson-Atkins, I stopped in the gift shop and purchased a postcard of the portrait of the Duchesse de Caderousse. I pinned it to the bulletin board in my office and often stared at it and wondered if the Duchesse had been as sweet and innocent as she appeared in the portrait. It was on that stormy day, while reading Elizabeth Vigee Le Brun: The Odyssessy of an Artist in an Age of Revolution that I learned more about the portrait of the Duchesse de Caderousse. Apparently, it had been the artist's idea to follow the trend toward simplicity and depict the young noblewoman sans face paint and powder. I also learned that the Toledo Museum of Art has had a Vigee Le Brun portrait in their collection since 1950. Just think of it! A frazzled librarian made an off hand suggestion I read a book about Marie Antoinette. I read the book, admire a portrait of the queen, and become such a fan of the artist that I travel the world in search of her masterpieces only to discover that one resides in the town where my journey began! How cool is that? Serendipity never fails to amaze me. By the time I finished reading that day, the clouds had parted, the sun was shining again, and I had a deeper appreciation for the talent and resilience of Vigee Le Brun (and the power of serendipity). 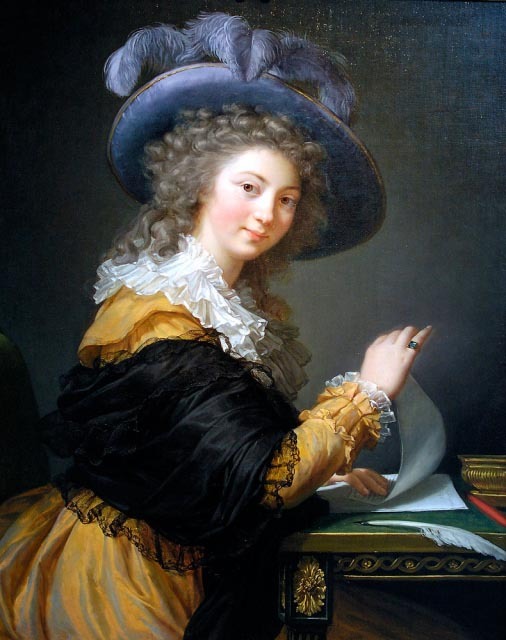 A prolific and tireless artist, she produced hundreds of portraits of some of the most famous and infamous people of her time (including Madame du Barry, Lady Hamilton, and Catherine the Great). Somehow, she managed to create masterpieces in the midst of personal misfortune and survive a Revolution. Isabella Marini painted by Elizabeth Vigee Le Brun in 1792. The Toledo Museum of Art. If you would like to view 586 of Vigee Le Brun's portraits, please click here. If you would like to purchase Gita May's biography of Vigee Le Brun, please click here . So we must thank Miss Shirley, musn't we?!? What a great obsession to have! 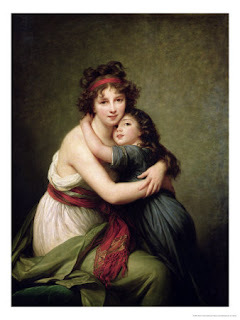 I cannot believe how prolific Miss Vigée-Lebrun was, I too am a big fan. I wish I could go back to those times and be a fly on the wall, and watch her at work...Fascinating (and oh so ROMANTIC!!!) time period. This is a lovely post and I hope you do not mind if I link to it! Thanks Elena! That's so nice of you. Gorgeous story. And gorgeous blog. I'm happy to discover it. Arabella ~ I am glad you enjoyed my blog and thank you for taking the time to let me know. By the way, I am working on an historical novel entitled Redemption. The main character is a strong, lovely woman who suffers a life-changing injury during an explosion that was meant to kill Napoleon Bonaparte. That main character is named: Arabella! I am not certain how you found my blog, but I hope you continue to visit! Arabella is a great story book name, with so many literary nuances. Sounds like you had a great day...wonder what Mdme Lebrun did on rainy days. You must read Elena Maria Vidal's book Trianon.....it begins depicting a scene where Madame LeBrun is painting a (one of many) portrait of Marie Antoinette, also beloved by Ms. Vidal. Julygirl! I have known about Elena Maria for quite sometime - from years ago when I operated LET THEM EAT CAKE, an award-winning, educational website dedicated to Marie Antoinette. And I have, indeed, read her book. Wonderful.